This semester I am teaching LCN600 Connected Learning, as part of the Master of Education course at Queensland University of Technology. This course explores online connected and networked learning. Students are first challenged to map and analyse a connected learning environment through the lens of the Connected Learning Framework by Ito et.al, (2013). They are also required to experiment with online professional learning through the development of their own personal learning network (PLN). The unit introduces many new concepts, theories and ways of learning to participants. For a few participants, this unit provides theoretical grounding for digital practices they have already been implementing in their teaching and learning. For others, it presents a challenge to step well out of their comfort zone, by encouraging active engagement and contribution in a variety of open online spaces. To ensure all participants have ‘somewhere to start’, all students are strongly encouraged to sign up to Twitter (if they do not already have an account) and to use this as one of their central PLN platforms. There is extensive research that suggests that Twitter is a very popular platform embedded within the PLNs of teachers’ (and others’) for professional learning (Bruns & Burgess, 2011; Carpenter & Krutka, 2014, 2015; Davis, 2015; Forte, Humphreys, & Park, 2012; Luo, Sickel, & Cheng, 2017; Visser, Evering, & Barrett, 2014). The relative ease with which teachers can acquaint themselves with the platform, the capacity to create a pseudonymous account if desired and the brevity of content shared in the form of Tweets are some of the reasons why Twitter is a platform of choice for those beginning to develop their PLN. To support, scaffold and encourage #LCN600 participants to engage with Twitter for their PLN development, I decided to hold a Twitterchat one week in place of our usual online lecture/tutorial. There were several reasons for this decision. Firstly, this type of learning is very accessible for those with PLNs and can be an effective aspect of Connected Learning. As an openly networked learning opportunity for participants with a shared interest and purpose, the Twitterchat embodies all four design principles of the Connected Learning Framework (Ito et al., 2013). Everyone can participate, as there are usually no limitations placed upon joining in a Twitterchat, and no technical requirements beyond an internet connection and Twitter account. As participants share their knowledge publicly, comment, give feedback on and build on others contributions, learning happens by doing, as participants become “coprosumers and coproducers of knowledge” (Megele, 2014, p. 49). Challenge is constant, as new responses and different interpretations are offered by a wide range of participants from different backgrounds, and the tweets are shared with great speed, encouraging quick thinking and agile meaning-making. Finally, everything is interconnected, as often participants draw upon and share digital resources through their tweets, including links, gifs, images or other artefacts to emphasis or exemplify their points. Secondly, by hosting a Twitterchat and running it for #LCN600 participants, I could ensure that it was a very supportive introduction to this evolving professional learning experience. Although there are many Twitter chats currently running on Twitter, the very fast paced nature of these chats, often populated with experienced Twitter ‘chatters’, can be overwhelming for newbies. The aim of hosting this Twitter chat was to ease learners into the processes involved and to give them an experience so that they could see if this style of learning held appeal. Thirdly, participating in a Twitterchat can be great way to build one’s PLN. 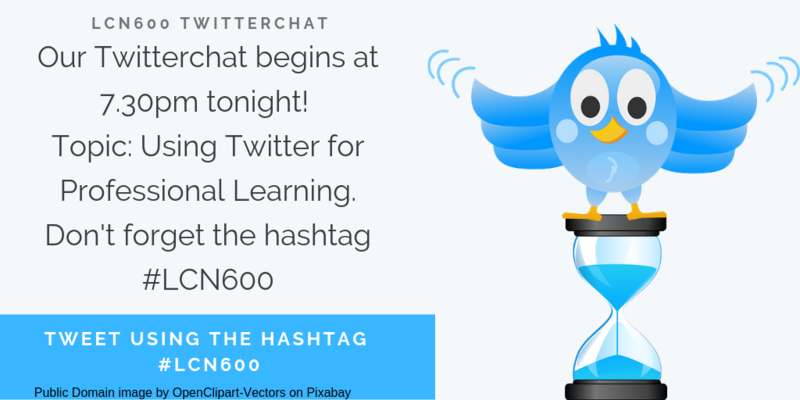 Although this Twitterchat used the subject code hashtag #LCN600, there were no limitations placed upon who could participate in the chat. As Twitterchats encourage rapid and multiple engagements, there is the possibility that participation may lead to new connections. Another advantage of participation in a Twitterchat is that it gives those new to Twitter an opportunity to contribute meaningful content which may potentially be shared by others. Often those beginning with Twitter for professional learning wonder what to share, and by providing questions and prompts to respond to, this quandry is overcome, particularly as the topic of the chat was one which I knew all participants of #LCN600 would have experience with and opinions about. I began by taking every opportunity to make it clear that in the week the chat was being held, a traditional online lecture/tutorial would not be taking place, and that we would be meeting in Twitter for the hour usually allocated for our regular weekly synchronous meeting. I provided resources explaining Tweetdeck and Twitterchats. These resources (available below and at the end of this post and CC Licensed for redistribution) were aimed at developing participants’ knowledge and comfort engaging with these platforms, and in the processes involved with the chat. Thirdly, I ran a preparatory tutorial explaining Twitter in detail the week before. Although much of Twitter seems self-evident, it is amazing how many small details that more experienced users assume beginners already know. Familiarity with the interface, with the structure of a Tweet and simple tips and tricks (included in the slideshow below) were presented and discussed, with time for questions and comments. There are a few things to remember when thinking about your responses. One: Twitter posts are short! 280 characters! You do not have to go into great detail at all! Succinct answers are best. If you can include a link to evidence, so that others can go back later to read more, that’s terrific! Two: there is no right or wrong. Twitter chats are about sharing your thoughts on a topic with other professionals. Your opinions and experiences are very valid and worthy of being shared with others – don’t be shy 😊. Three: when you answer, begin your tweet with A (for Answer) and the Question number to which you are responding. E.g. when replying to question 4, your response will begin A4. Finish your post with the hashtag #LCN600. It is essential that you include the hashtag in every post during the chat, so your response is not lost! I will be collating all of the tweets into chronological order so that they can be read in sequence after the fact, and I may miss your tweet if it is not hash tagged appropriately! On the day of the chat, I posted on Twitter in the morning, and again in the afternoon, using the hashtag and reminding everyone that the chat would be happening that night at 7.30pm. About an hour before we began, I posted this message again, to make sure that everyone had an opportunity to be reminded about the upcoming chat. I then warmed up my fingers 😉 and prepared for the onslaught! I had prepared images with the questions/prompts beforehand, and used these so that when a new question was published it was more likely to be noticed by those who may be feeling overwhelmed by the speed of the chat. A copy of these images is included below for inspiration. Although the pace was quite fast, I was able to keep up in responding to (almost) everyone (almost) everytime, which I felt was important, so that participants did not feel invisible or that their comments were of less value, a noted drawback in previous research (Davis, 2015). This was possible because of the relatively small number of participants (about 13 joined in synchronously, with others joining after the initial hour had run). I also happen to be quite a fast typist, which helps immensely! I tried to maintain a regular pace with the questions, and paused a few times to ask how participants were travelling. I sent a few general ‘encouragement’ tweets if I saw energy was flagging, and cut down the number of planned questions to allow more ‘thinking’ time and to encourage participants to respond to each other as well as to the questions. I also sent a few reminders to label each response with the relevant number (e.g. 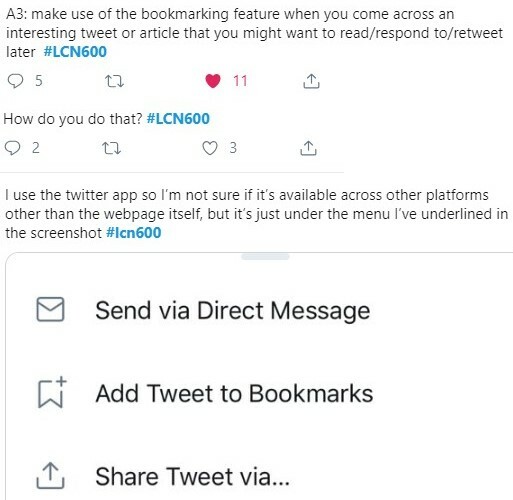 responding to Question 2, use A2 to avoid confusion if tweets were sent out of order) and also to add the hashtag #LCN600. Overall, I was thrilled with how the tweetchat went. I could see conversations among participants sparking, and supportive comments and feedback explaining, encouraging and commending. I am eager to collect further feedback from those who participated. Many on the night shared that they were a little overwhelmed at the speed of the exchange, but that they enjoyed the new ideas and the different experience. Below you will find a collated copy of the chat which I curated in Wakelet. I did this immediately following the chat so that nothing was missed, although this means that posts that came through during the night were not included. This allows those who couldn’t participate to ‘catch up’, and also is a useful reflection for those who did join in. Keeping up with all of those tweets is hard work! Definitely! As a way of introducing a new technology, encouraging connection and engagement and providing a different learning experience, I feel that the Twitterchat was a great way to address some of the learning outcomes planned for this unit. Is it a strategy useful for every topic? Definitely not! Participating in a Twitterchat is not for the faint-hearted, and there are many times when sharing learning publicly in this way would not be appropriate. However for the right concept and the right group, it can definitely contribute to the learning opportunities offered in a formal learning context. If you have any questions or would like to chat further about this pedagogical strategy for professional learning, please feel free to contact me! I have included the relevant resources that I have created to support this experience throughout the post and below. I love talking about how we can make online learning engaging, fun and meaningful, and am looking forward to continuing to push boundaries, encouraged by the inspiration of the participants who are so eager and willing to try learning in new ways. Here’s the information I prepared for participants outlining how to join and engage with a Twitterchat. Let me know if you find it useful! Wow, sounds like this was an amazing authentic connected learning experience for you and the students! You’ve created some fab supporting resources as well. Rather than ‘out with the old’, doesn’t Twitterchat complement/enhance a wide CL repertoire? Thank you Hilary! I guess the ‘out with the old’ was with reference to introducing new styles of interaction rather than sticking to traditional lecture/tutorial formats. Even though the online tutorial format which I follow (modelled on your great inspiration and and that of Dr Mandy Lupton :)) is not at all old fashioned, I have become increasingly aware of practices that see online lectures as simply the presentation of slides or pre-recorded content, replicating (perhaps poorly) the old style face to face lecture. I was trying to be a little provocative with the title…to challenge readers to think about new ways of interacting and learning online embedded within formal university courses. I agree that it was a very authentic, and highly connected learning experience for all of us- my blog post is a testament to my own learning as well! Thanks so much again for your comment. What a great experience, Kay! A brilliant introduction to Twitter! I was so excited to follow the progress of the students! It was lovely to see some familar names pop up . Thanks Mandy! It was a really fantastic chat, and everyone was so great – we all learned a lot :).